While on vacation recently, I had the most delicious and unusual burger. It was a falafel burger (genius!) topped with a yogurt sauce, hummus, lettuce and tomato. Love at first bite! I couldn't wait to get home and try to make one. As it turns out, it couldn't be easier. So move over veggie burger and make room for a new favorite! Drain the liquid and discard. Purée the chickpeas, garlic, onion, cilantro, and spices in a food processor until smooth, about 2 minutes. Form the mixture into patties and set aside to dry slightly, about 30 minutes. Heat oil in a sauté pan. Add burgers and cook over medium heat until nicely browned on both sides. Serve with tahini lemon yogurt sauce, grilled onions, lettuce and tomato. Delicious! You'll never miss the beef. Soak the dried chickpeas in cold water to cover by 2 inches and allow to soak for 12-24 hours at room temperature. 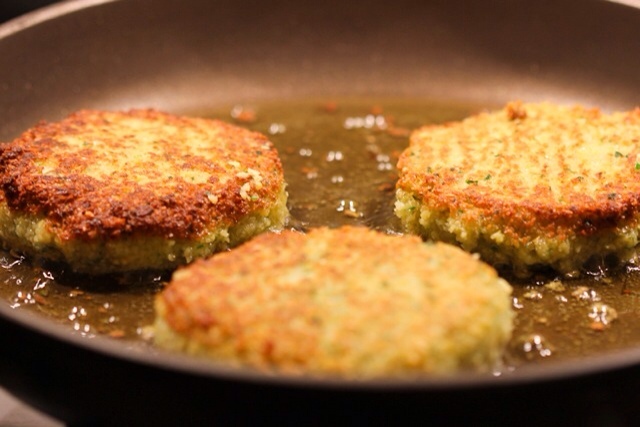 Form the mixture into patties and set aside to dry slightly, about 30 minutes.Heat oil in a sauté pan. Add burgers and cook over medium heat until nicely browned on both sides.